“I just love it,” she says. Bowen is an assistant professor, teaching stream at the University of Toronto Mississauga's Institute of Communication, Culture, Information and Technology, and an accomplished visual artist. She has spent her career studying visual art education, visual culture and studio pedagogy, including an ongoing study of graffiti that dates back to the 1990s when she followed the work of young graffiti artists making their marks in alleys and industrial spaces around Toronto. “I was interested in how these artists were working within a traditional education environment and also owning the craft,” she says. Nearly three decades on, Bowen’s interest in graffiti continues. She seeks out urban art on her travels to graffiti hotspots like Lisbon, Berlin and Toronto’s own Graffiti Alley. 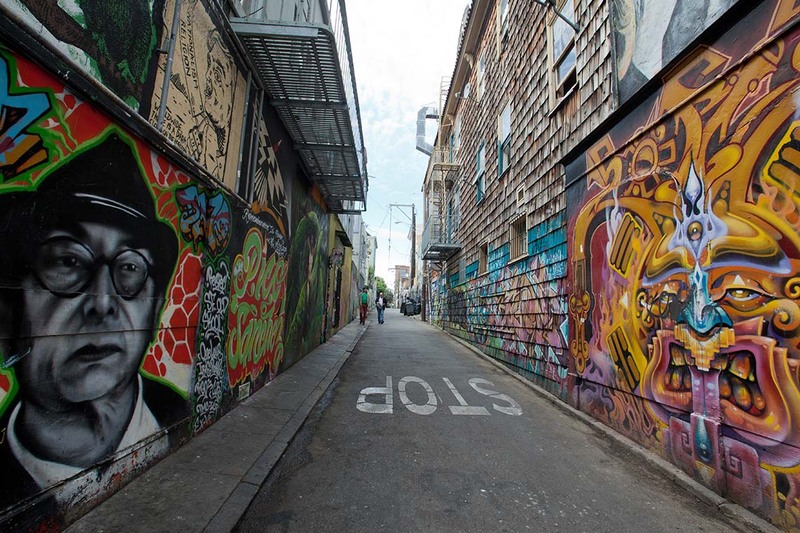 Recently, her work has taken her to California, where her current research examines the social and political messages of graffiti artists working in San Francisco and San Diego. In those cities, established Mexican neighbourhoods are enduring rapid change due to gentrification. The community response – which Bowen dubs “gentriffiti” – is literally written on the walls. In San Francisco’s Mission District, Bowen examines the neighbourhood's historic Precita Eyes murals, community-created frescos that date back the 1970s and chronicle the vibrant and thriving Mexican community. But Bowen is also interested in the ever-changing graffiti murals in adjacent alleyways, which provide a more current look at the events shaping the neighbourhood. “The murals in the alleyways are in conversation with the historical murals,” she says. “They also speak to history and culture, but also to more current issues. She points to sidewalk stencils and graffiti murals that read “Google, get out!” or “This city is not for sale,” and to school wall murals by eighth-graders that document how it feels to live where their friends are being evicted. Similar responses can be seen in San Diego’s Chicano Park, where the park’s famous murals cover the pillars of the Coronado Freeway overpass. “It’s an amazing history lesson about the people and the history,” she says. “Go for a walk in the Mission or Chicano Park and you’ll learn a lot about what happened there historically and today. The kinds of things we hear about on CNN are narrativized on the wall. It’s a different way of documenting life and culture and history – and historical perspective.